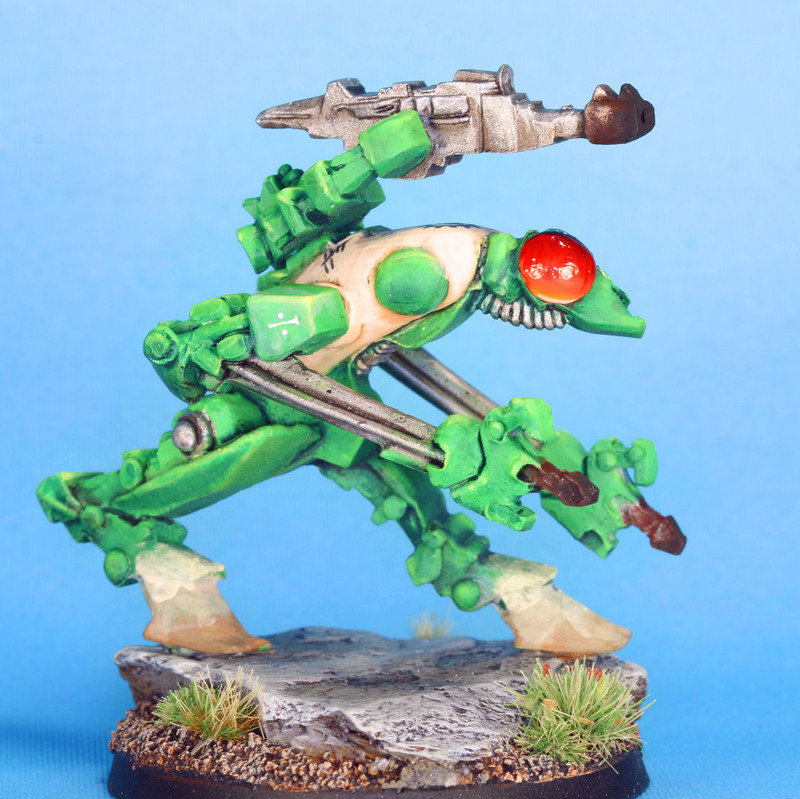 One more robot down, one more left until I have completed the set of old Rogue Trader robots for Orclord. This is the one I have been looking most forward to painting, although he turned out to not be nearly as fun to paint as the last two. 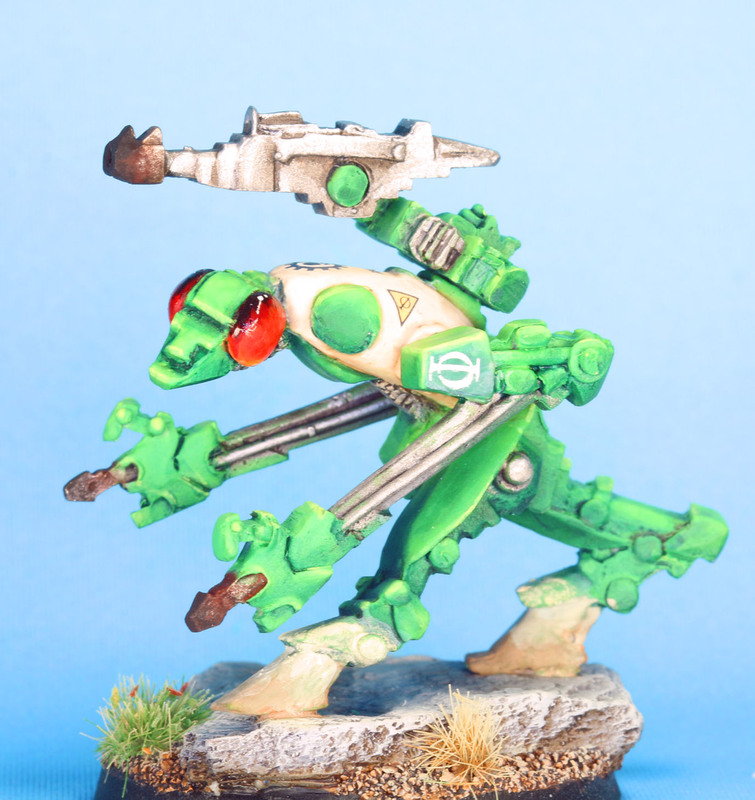 I knew I wanted the bulk of the model to be green, based on its insectoid appearance. Initially, I was going to go with something fairly earthy and natural looking. 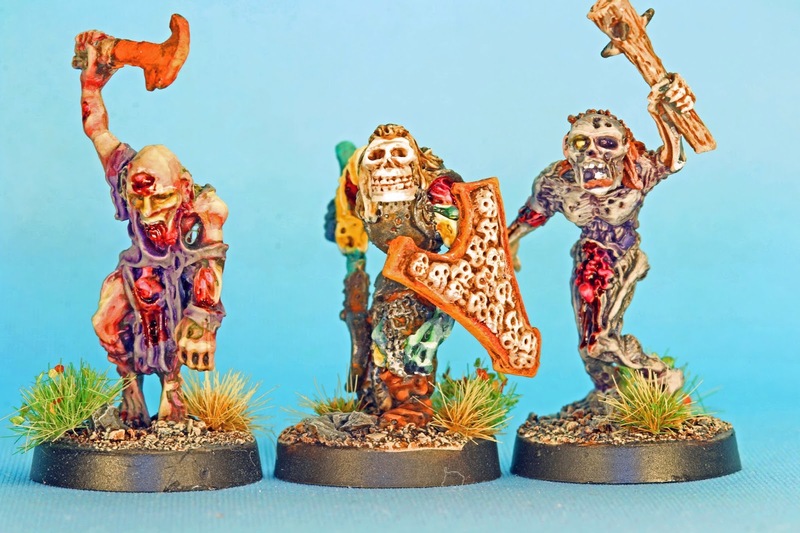 But while thinking about it, I decided that these were Rogue Trader models, and needed to be painted with bright 1980s colors. I did reserve the back to be painted with more earthy tones to act as contrast. Like many early models, this model was more pockmarked than an Edwardian sailor. But, because of all the flat surfaces, it was easily fixable. I applied a couple of layers of Gunze Sanyo's Mr. Dissolved putty to most of the model and let it dry overnight. The next day, I did a lot of sanding and touched up some spots that didn't get properly filled and repeated the process. When it came time to paint, I airbrushed the carpace with a mix of Vallejo Game Air Bronze Flesh and White. I applied a couple of highlights by mixing in more white. Afterwards, it got a coat of gloss varnish. I gave the varnish a few days to dry and cut a mask to fit the white portions (well, those intended to stay white!). 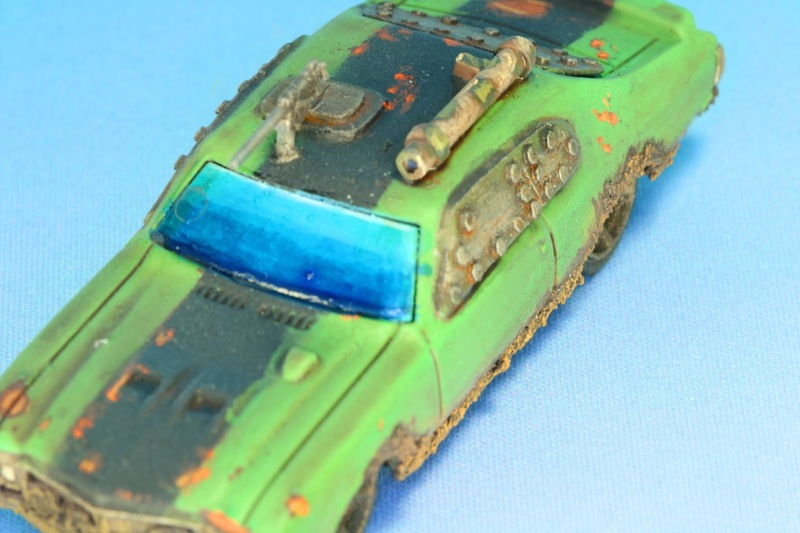 The next step was to airbrush Vallejo Game Air Snot Green. 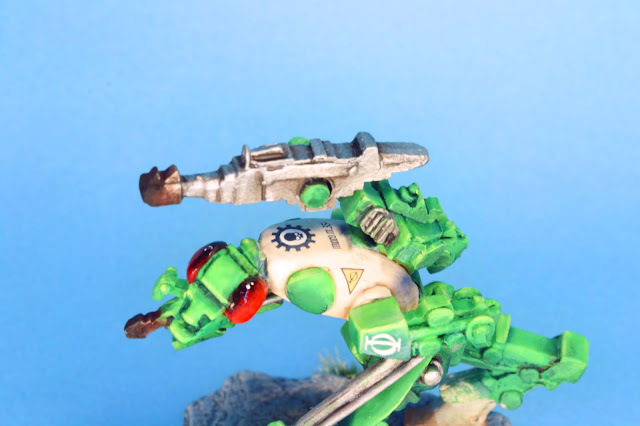 I then applied some shading with Vallejo Game Air Dark Green. Then I switched to brush painting and added further shades by mixing in Caliban Green and then black. For the highlights, first mixed in GW Scorpion Green to the Snot Green, and then, eventually, I began adding in yellow. For the metallics, I began with GW Ironbreaker, which was washed with P3 Armor wash and highlighted up by mixing in GW Stormhost silver. The giant eyes were painted with GW Khorne Red, shaded by mixing in black and highlighted by mixing in orange. At this point, I had to touch up the white. But thankfully, Bronze Flesh is a very strong color, even when thinned. That's one of the reasons I used it for a base! After I was done touching up the white, I applied a wash of Bronze Flesh mixed with a little GW Gryphonne Sepia. This dirtied it up a little too much for my liking, so I reapplied the highlights again. Finally, I applied a thinned wash of Ammo of Mig's Rainmarks Effects. After that dried, the body got a coat of gloss varnish. The next day, decals were applied. It was at this point that I noticed that the shoulder of the right arm was still really pockmarked! So I had to redo the Mr. Dissolved Putty and lightly sand it to smooth it out. I repainted the green, achieving what is probably the single best blend I have ever painted. It goes so smoothly from Caliban Green to yellow that it looked like the kind of blending some of those crazy good French painters pull off. Unfortunately for you, the reader, the giant, empty shoulders were mocking me. So I put decals on them, covering up my amazing blend! The shoulders got another wash of thinned Rainmarks Effects to fade them a little. After the final coat of varnish, I applied pigments to the gun barrels and to the feet. Orclord has since requested that I tone down the dust on the feet, so the finished model looks a little different than what is pictured here. Right behind that emblem is some of the best blending ever, I swear! Check out my back tats, bro! After a month of rotting, putrid carcasses, I'm now veering in another direction with another unfinished project checked off! This is the first of about five cars I'm planning on doing for Dark Future or other pose-apocalypse car games. 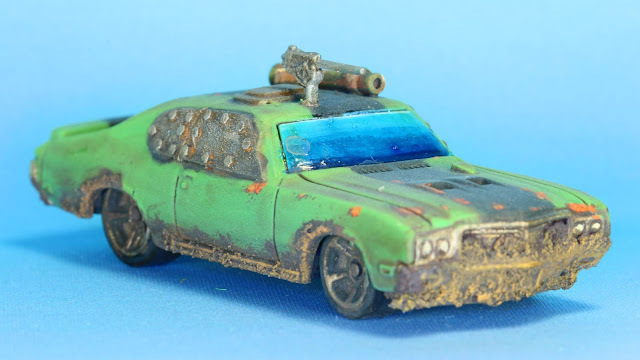 Several years back, there seemed to be a boom in people in the oldhammer community converting hot wheels and matchbox cars for Dark Future. So I thought I would try my hand an picked up a hot wheels 1970 Buick GSX. And promptly did nothing with it. Eventually, I opened the package and scrubbed off the decals with acetone. That is where I realized mistake #1: always pop the rivets and separate the body from the rest of the car BEFORE using any paint stripper. Quite embarrassing really, since I am very experienced with stripping models and know what is and is not plastic safe. After that fiasco, I went to work on making it look post-apocalyptic. I added some metal covers for the side and rear windows, fashioned a hatch for the top, and attached a machine gun and a small rocket launcher. This was where I realized mistake #2: buy as many upgrade parts from professionals as you can, modeling at such a small scale is hard! Next was priming and the rust undercoat. 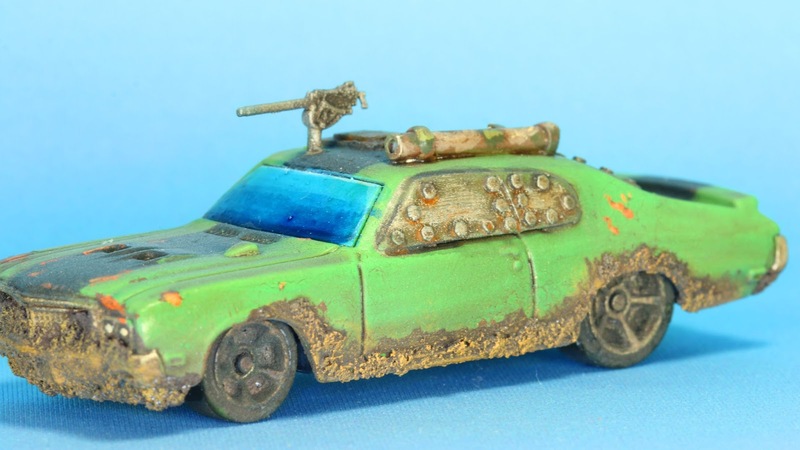 I airbrushed the whole car with Vallejo Game Air Dark Flesh, which turns out, looks nothing like the old GW Dark Flesh. But it was still brown-red, so it worked. After that, I put a coat of gloss varnish to protect the rust color from the worn effects that would (eventually) be applied. This was the next major stoppage in this project. So it sat all rust colored for several months while I thought about the color scheme. Eventually I decided on a mint green, a color stereotypically associated with American cars from the 1970s. But I also knew I wanted a racing stripe. So I laid down a coat of AK Interactive Worn Effects and let that dry, per the instructions. Then I airbrushed a wide black line down the center. I took a damp, stiff brush and rubbed off bits of the black, making sure to pay special attention to the edges. After that was completed, it got another coat of gloss varnish. Then I cut a strip of masking tape in the width I wanted the stripe to be and applied it to the car. Then, another coat of AK Interactive followed by Vallejo Game Air Scorpion Green. I added a couple of zenithal highlights by mixing in white. I removed the masking tape and went back to work with the damp, stiff brush. And another coat of gloss varnish. 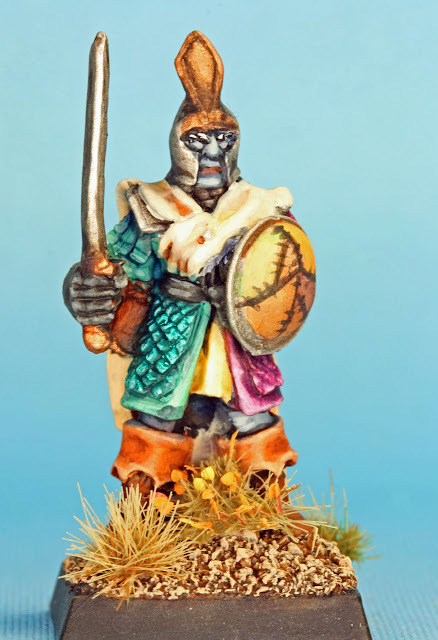 The metal plaints were painted with GW Chainmail and the Chrome with GW Stormhost Silver. 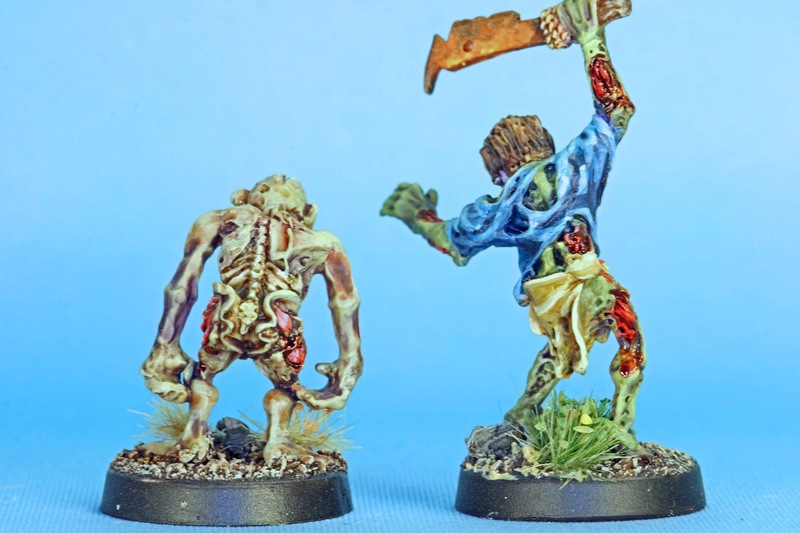 Both were washed with GW Typhus Corrosion and the steel parts were also washed with AK Interactive Rust Wash. I painted the bazooka in desert camo to give the impression that it was stolen from some military vehicle. Around the bottom I applied several layers of GW Stirland Mud. 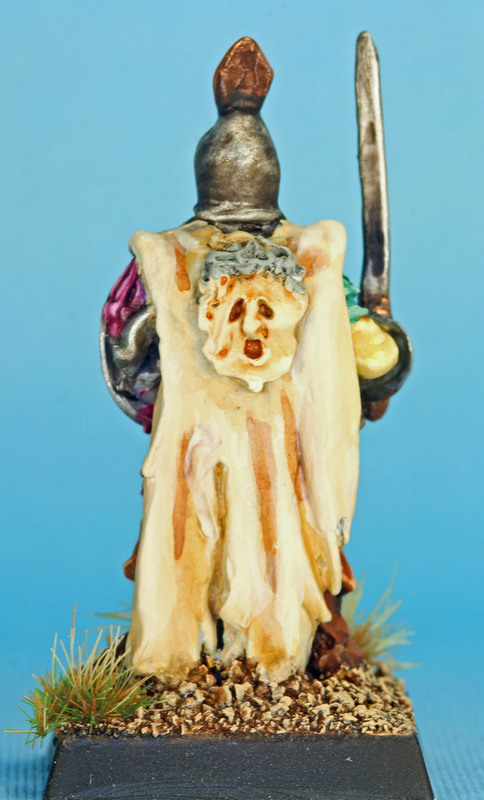 This was also washed with Typhus Corrosion and then drybrushed with Vallejo Game Color Plague Brown. The rusty spots were highlighted with various ochres and bright oranges. This is where mistake #1 came back to really bite me. The tires were a mess, as they were a little melted and needed to be painted. That was a pain. 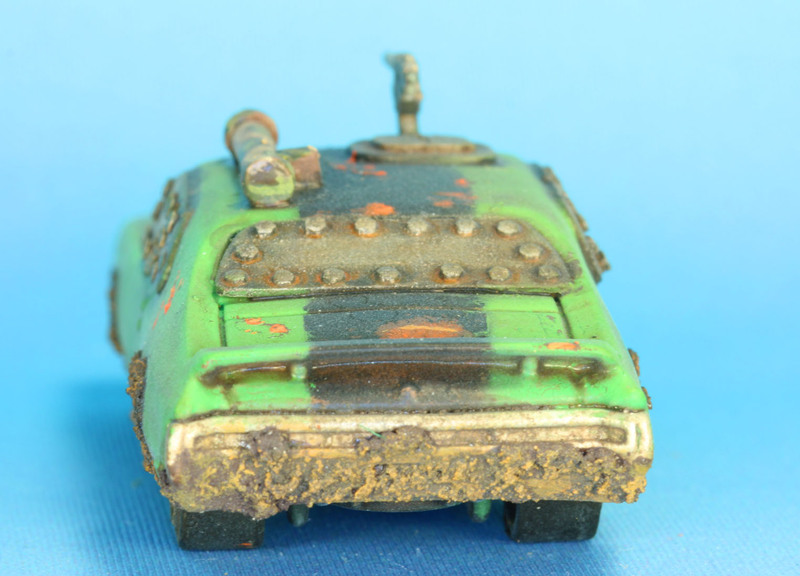 Afterwards, the tires and the rims were also given a wash of Typhus Corrosion. 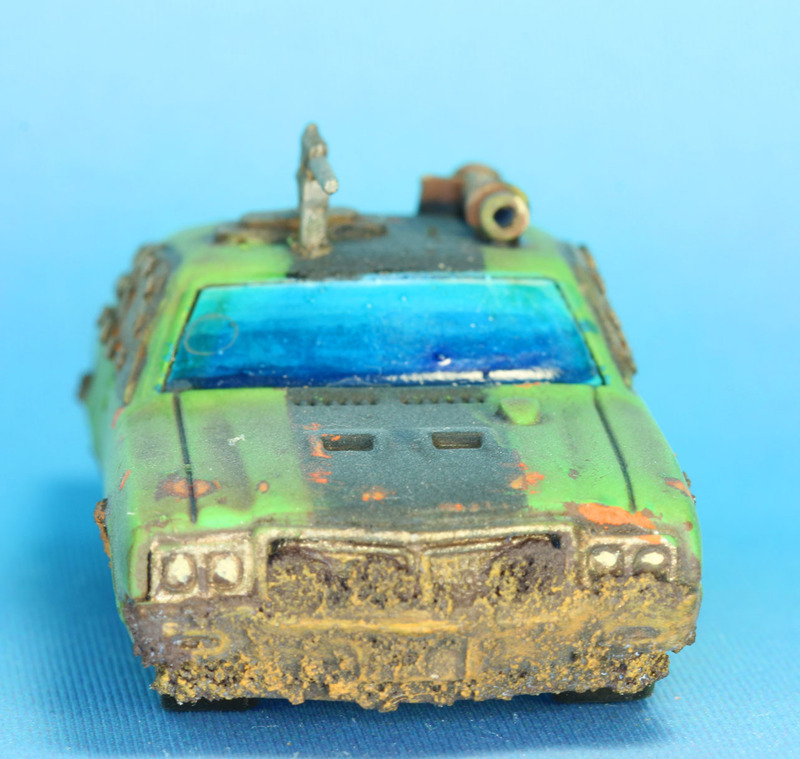 A this point, the entire car had a couple of thinned washes of Army Painter Soft Tone ink to make it look dirtier and bring out some of the definition. The front windshield was "blended" from dark blue to white. I would like to think I put the highlights at the top because I envisioned the car riding off into the sunset with the light source low on the horizon. But the truth of the matter is I had a brain lapse and screwed my highlight up! There is also, somehow, a brown spot on the windshield. I have no idea how that got there and didn't even notice it until I took the photos! But after varnishing the whole model, this got a brushed on layer of gloss to amp up the shininess. The Zombie Crew and a Dark Elf too! Okay, after a short break, I've got even more zombies to show off! 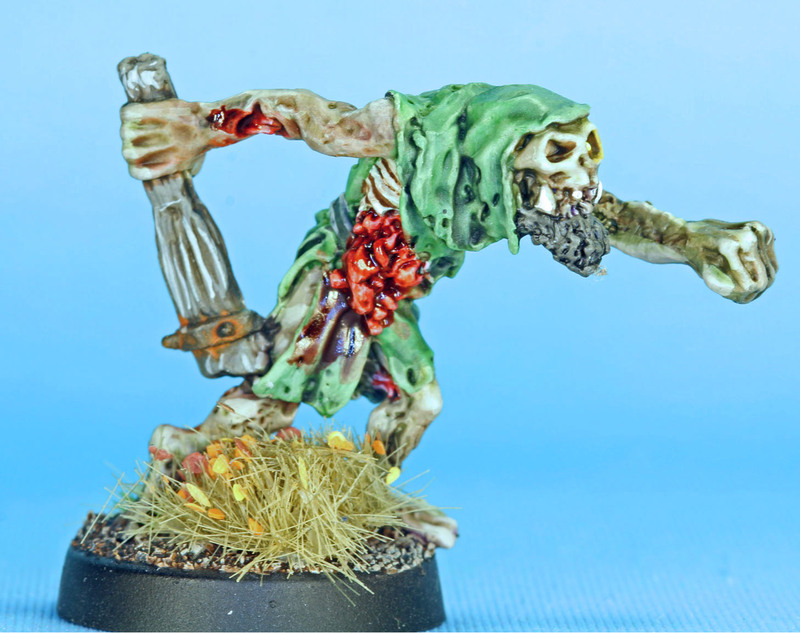 As I said in my post about the Frostgrave zombies, I tacked in some of my personal zombies when painting the Zombies of Karr-Keel. These were especially interesting to paint because these are also Kev Adams' zombies from the old Citadel C18 range. And to be quite honest, as much as I loved the Zombies of Karr-Keel, I love these more. 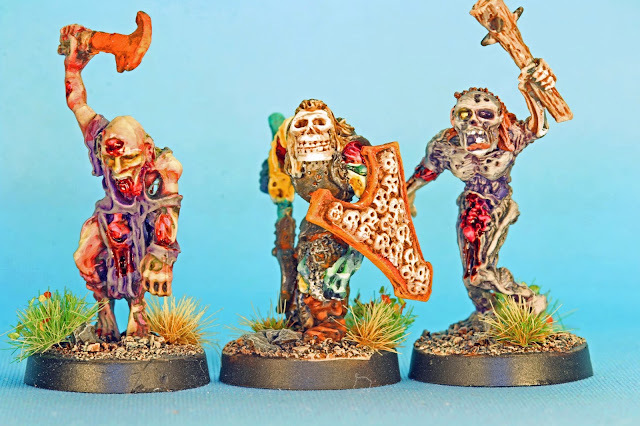 These look far more rotten than Kev's more recent sculpts and they also lack some of the texture than the Zombies of Karr-Keel have. There is still plenty of texture on these too, but they suit my painting style a little better. These were painted in much the same manner as the Frostgrave zombies (being that they were painted at the same time and all), but I did use one of the Via Ludibunda Shields of Vileness for the champion. Caius over at Lead n Paint hooked me up with another pre-slotta dark elf Manflayer as well. 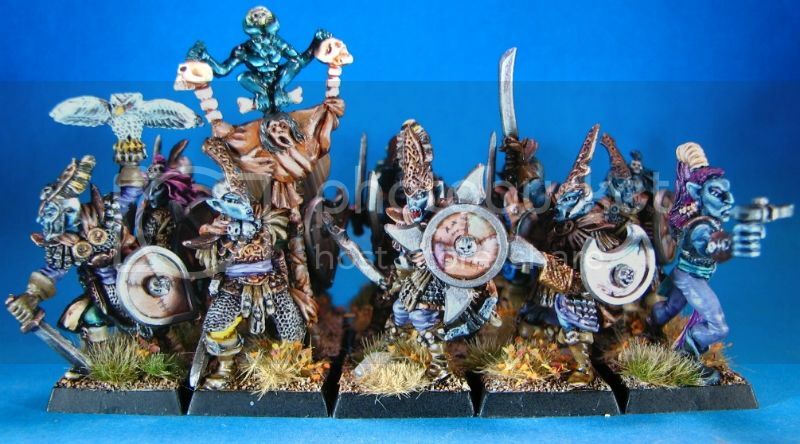 When I painted the unit, I included an assassin, giving me only 11 actual warriors in the unit. I noticed this when I went use the unit at NOVAOSRGOT and had to stick an extra crewman in the unit. Unfortunately, this is definitely not one of my better paint jobs. I was rushing him and on an off night. But when put in the middle of the back row of a unit, he'll look "good enough." And that is all I can ask for. If you're really interested, the rest of the unit can be seen here. I squint in your general direction!